This is the #2nd set of How To Start A PHP user group in an attempt to help PHP guys all around the world to spring out a local PHP user group if they do not have one nearby. So before you embark on this journey, you need to know what you have to expect, how to prepare yourself, the pitfalls, the to-do lists, the workload behind, the commitment behind and above all the gratification this can bring to your PHP life. Who Are James Titcumb & Organisers Of PHP Hampshire? 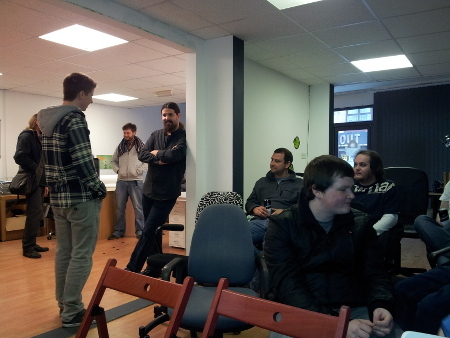 Last time I welcomed the PHP Hampshire User Group here on 7php – where James talked about the group, the crew, how it all started and everything else..
Is there a market? Are there ANY people around who are in PHP? If you live in the middle of no-where, don’t create a UG for your village. Either find one in nearby cities, or look into Nomad PHP. Promoting is always the biggest challenge. Getting the word out about your group is intensely difficult, but thankfully other members of the PHP community are really helpful, for example the ug-admins mailing list on php.net. Decide how you want it to work – mailing lists are a good starting point. I suggest getting at least two other people involved as well. Start by meeting at a pub, decide where you want the future to be. The most important point I have learnt is that you must be decisive and take the lead. Have faith in yourself to make the right decisions, and don’t allow decisions left to the community to stagnate – gauge feedback, but at some point you need to make a decision in order to move forward. A founder of a group is like a manager of a company – they are looked up to for direction, decision making, fairness and everything else. Don’t be prejudiced, and don’t ignore feedback from your UG. Constantly get the group members involved where they want to (but don’t harass them). Make sure you keep organising meetups, otherwise people will forget about your group! >> How to encourage members to participate and attend meetups? Members are encouraged to participate by the organisers asking for opinions, help with organisations and asking for help with specific items (for example developing the website) on the mailing list and Twitter account. Interestingly, so far our speakers have either been local people from within the group, or speakers that have approached us. Quite simple – they should have something interesting to share with everyone, and be done “the right way”. So far we have only been sponsored by companies closely involved, so we have not had to hunt hard for sponsorship. Our biggest mistake was thinking that there would be reasonably priced venues available to hold conferences – this is absolutely not the case, most venues are extremely expensive, sometimes prohibitively so! It’s hard work, but is very rewarding knowing you are helping the community. Absolutely support your local PHP user group. If there is not one, consider starting one. Alternatively, join Nomad PHP – there are no excuses not to learn more about your industry! Great point on events organizing. Mainly for starters, thanks for sharing!